A soldier hunts for his wife and son in a post-apocalyptic America. Just like Twilight duo Kristen Stewart and Robert Pattinson, Shia LaBeouf has been doing his best to shake off his association with a critically reviled yet wildly successful blockbuster franchise by appearing in a diverse selection of roles, and like Stewart and Pattinson, it's progressed his talents inordinately. LaBeouf was one of the highlights of last year's American Beauty, and he's by far the best thing about Man Down. Reteaming with director Dito Montiel, who gave the actor one of his first worthy roles in 2006's A Guide to Recognizing Your Saints, LaBeouf plays Gabriel, a marine, who along with his long-time buddy Devin (Jai Courtney), traverses the landscape of a post-apocalyptic America, seemingly the result of a mass biological warfare attack, in search of his wife (Kate Mara) and son (Charlie Shotwell). Montiel juggles numerous timelines in his fractured narrative. Along with the post-apocalyptic storyline, we witness a lengthy meeting/interrogation between Gabriel and army psychiatrist Captain Peyton (Gary Oldman) in the aftermath of a traumatic event, while we're also offered snatches of Gabriel's life before shipping out to Afghanistan, along with scenes of himself and Devin on their tour of duty. Keeping all these elements coherent poses quite an editing challenge, and it's telling that two editors (Jake Pushinsky and Mark Yoshikawa) are credited here. For the most part they do a pretty good job of maintaining coherence, but there are moments when the time-shifts feel jarring, particularly in the final act, when a major twist is revealed in somewhat awkward fashion. That climactic surprise aside, Man Down doesn't add much to the genre of films revolving around American intervention in the Middle East, and its portrayal of PTSD comes off as exploitative and stigmatising, which surely can't have been the film's intent. 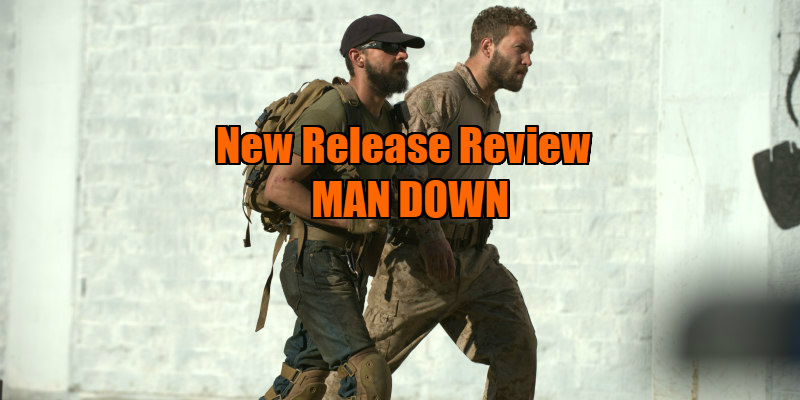 What makes Man Down just about worthwhile is LaBeouf's central performance, which really gives him a chance to flex his thespian muscles in a rare leading role. Thanks to his offscreen antics, he's become a divisive figure, but it would take a certain level of ignorance at this point to deny his acting talent, which he employs here to elevate a movie that probably isn't deserving of his unique charisma. Man Down is in UK cinemas and on Digital from March 31st.